Le Roi est mort, vive le Roi! Fine Dining is dead, long live Fine Dining. The past five years have been truly challenging for the fine dining industry. Faced with the new economic reality that gradually set in after the financial crisis of 2008, lots of restaurants have been tinkering about with a new-style fine dining concept. Numerous restaurants relaunched with more casual concepts, and some restaurants in the UK and Belgium (amongst others) handed back their Michelin stars (yes, I know officially they can't be handed back, but still). Sadly there were also restaurants that weren't able to turn the tide, and had to close their doors. Meanwhile, a lot of often overexcited ink was spilled on the subject of "the death of fine dining" but fashions change and a few weeks ago the first "fine dining is back" piece was published. That is not to say that everything is now rosy in the world of fine dining, or in the restaurant world in general. After the terrorist attacks in Paris and Brussels, both cities have seen lots of empty tables. I visited Paris at the end of April, which is usually the bustling start of the spring/summer holiday season, but I have never seen the city so quiet. Fine dining is alive and well, but it did change. Nowadays fine dining is no longer only about starched tablecloths, chandeliers and crystal stemware. It still can be, but it doesn't have to be. There's just more choice; sometimes you want to dress up and see the full show with all the bells and whistles, and on other occasions you just want to watch the culinary fireworks in your jeans. For the ultimate in opulence and 'bells and whistles' you need to head to Paris, because if there's one place were fine dining most certainly didn't die, it's here. In fact, I don't believe there's any other city in Europe that's as unapologetic about fine dining (or shall I switch to La Grande Cuisine here) as Paris is. But then again, fine dining is an art form, and why would you be apologetic about that? 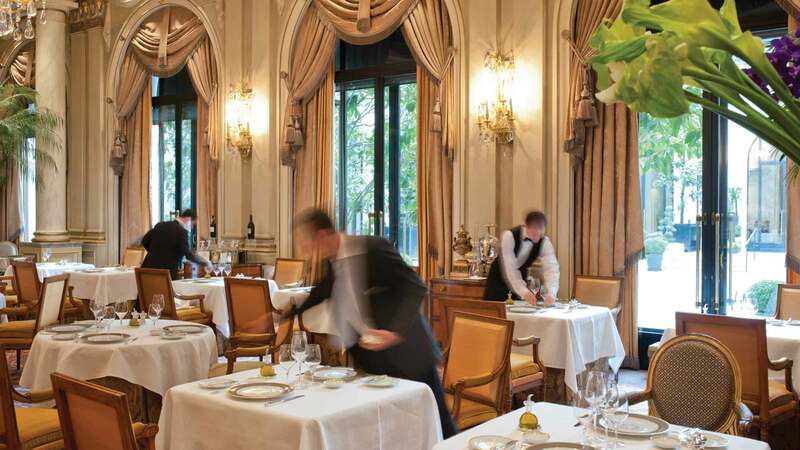 In Paris La Grande Cuisine usually goes hand in hand with a grand and opulent dining room, and the dining room of restaurant Le Cinq at the Four Seasons George V Hotel ("George V") is a prime example. Thick carpets, mini palm trees (yes, why not), a gigantic crystal chandelier, and silver and other objets d'art dotted around the room. Add to that a comprehensive service and kitchen team of around 100, and a 50,000 bottle wine cellar (presided over by the excellent sommelier Thierry Hamon). 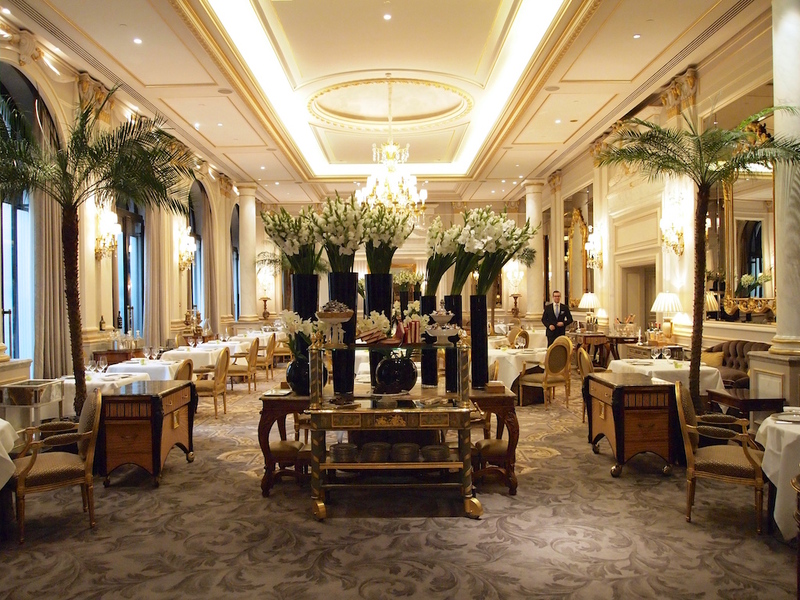 Admittedly, nowadays, only a hotel like George V (owned by Kingdom Holding Company based in Saudi Arabia), with seemingly unlimited means, can afford to maintain a restaurant like this. Executive chef at Le Cinq is Christian Le Squer (b. 1962), who joined the restaurant in October 2014, having previously been executive chef at the illustrious three Michelin starred Pavillon Ledoyen ("Ledoyen"). Christian Le Squer started his Paris career training in multi-starred kitchens, such as The Divellec (then 2 stars), Lucas Carton (then 3 stars), Taillevent (then 3 stars) and The Ritz Hotel. In 1995 he became head chef at Restaurant Opéra and a year later Michelin awarded him his first star. A second star followed in 1998, but the year after Le Squer succeeded Ghislaine Arabian at Ledoyen, which held two Michelin stars at the time. Christian Le Squer managed to maintain these stars in the 2000 Michelin guide, and in the 2002 guide Ledoyen was awarded three Michelin stars - an accolade Le Squer held on to until his departure in the summer of 2014. The two stars of Le Cinq were again maintained in the next guide and, as some had already expected, a third star was awarded in the 2016 guide. Le Cinq is open daily for lunch and dinner and you can choose between an a la carte menu (starters €70 - €140, mains €92 - €180, desserts €32 - €40) or the "La Balade Gourmande" menu (9 courses for €330) and at lunchtime a "Le Déjeuner Gourmand" menu is also available (4 courses €145, 6 courses €210). I had lunch with my husband at Le Cinq on Monday 25 April 2016 and we both had the 6-course lunch menu. The main course on the menu that day was lamb, and since I don't like lamb, I requested to have Christian Le Squer's signature "Spaghetti en timbale truffée" in stead. I also changed the dessert course, but in the end I was served two desserts, the one that was on the menu that day and my requested "Croquant de Pamplemousse". Today's menu started with three splendid appetisers. There was cocoa butter bonbon with a refreshing liquid tangerine filling; a beautifully made, transparent bubble with an elegant semi-liquid filling of orange, ginger and Campari, and finally a delicious foie gras terrine with passion fruit jelly, sandwiched between two coffee-flavoured tuiles. 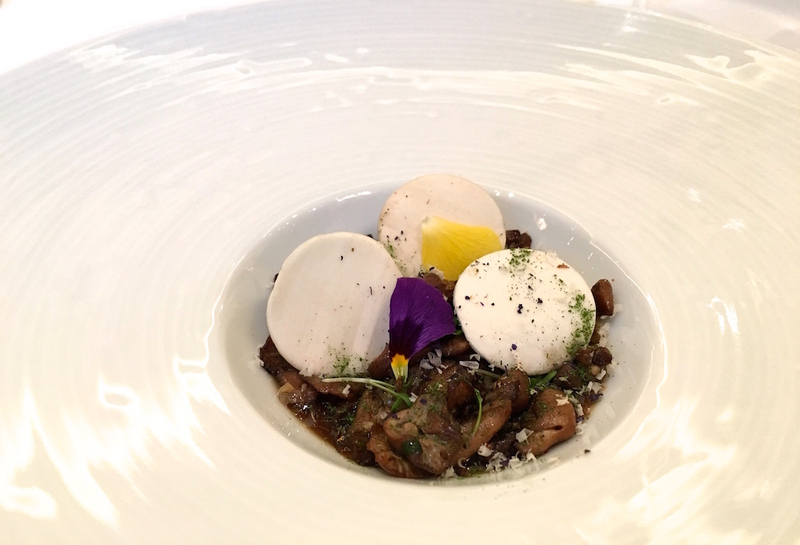 This was followed by an amuse bouche of creamy aubergine puree, topped with various types and preparations of mushroom, such as pan fried Saint George's mushrooms, sliced raw white mushrooms, and some umami-rich dehydrated mushrooms. A delightful combination with lovely musky flavours from both the aubergine puree and the mushrooms. 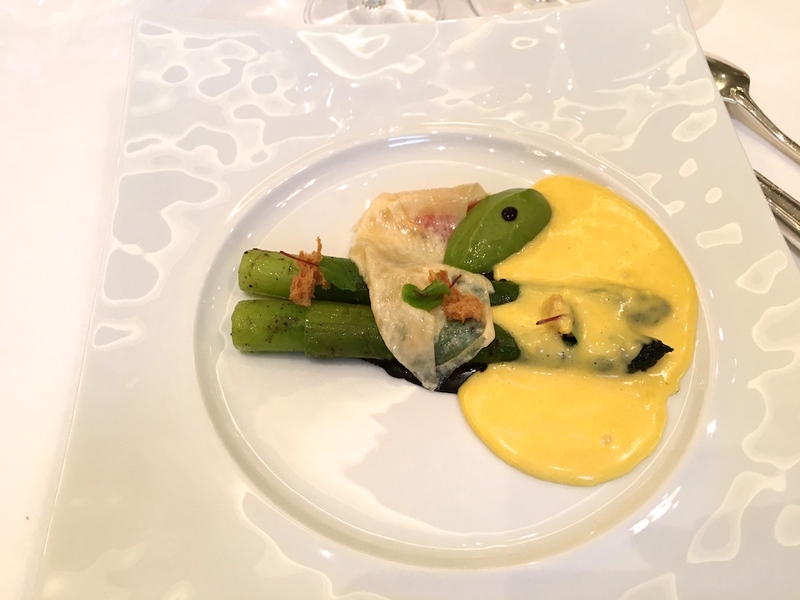 Next up was the first course of the lunch menu: green asparagus (from Vaucluse), dark black truffle puree, green asparagus puree, grapefruit jelly, some milk skin, and a Vin Jaune sabayon. Superb asparagus, which had been cooked in truffled butter, giving them a lovely rich finish. The Vin Jaune sabayon was distinct and intense in flavour and it underscored the nuttiness of the asparagus wonderfully. Lovely rich earthiness coming from the black truffle. A dish with compelling and full-bodied flavours and certainly setting the tone for the rest of the meal. Equally intense and bursting with full-bodied flavours was the next dish: "Gratinée d'Oignons à la Parisienne / contemporaine", a contemporary take on the classic Parisian style gratinated onion soup. 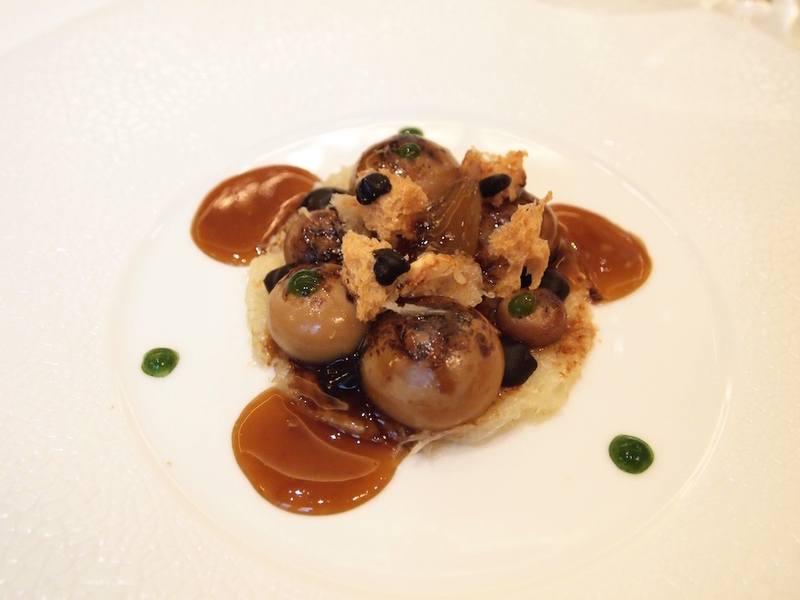 A terrific composition of confit onion compote (seasoned with Parmesan), lightly charred onion spheres in various sizes, black truffle puree, a concentrated and sticky onion sauce, Parmesan croutons, and finally a few dots of thyme-rosemary puree. An exquisite dish offering a perfect fusion of classical and modern (molecular) techniques and a great interplay of decadently rich onion flavours and textures. Best of all were the onion spheres, which had a divine, soft and seductively sweet onion puree filling. Third course was expertly cooked red mullet, with moist and rich flesh, accompanied by a shiny Chinon sauce, a few spoonfuls of orange puree/marmalade, pickled turnip filled with raw turnip puree, and turnip-Riesling jelly cubes. 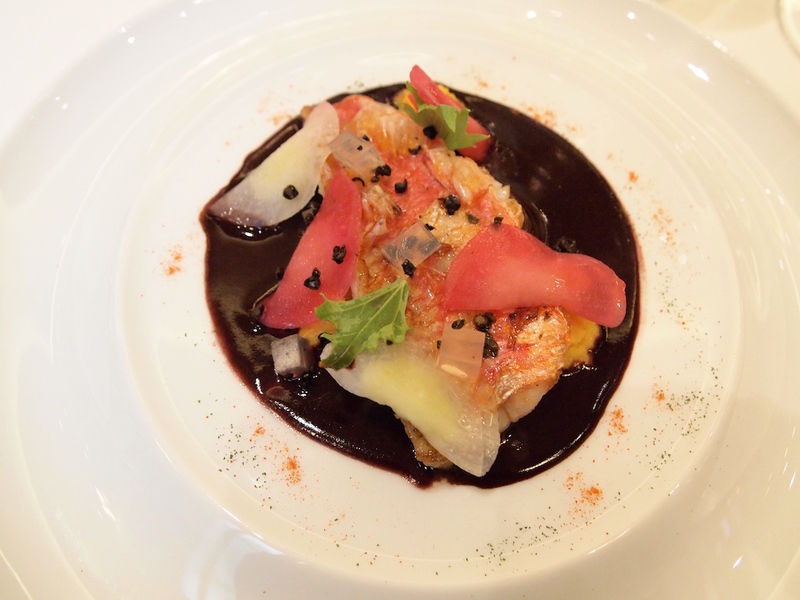 The Chinon sauce had been flavoured with the red mullet's liver (à la Becasse), resulting in a borderline overwhelming, complex-tasting sauce, and when combined with the almost gamey red mullet, maximum flavour-volume was reached. Not a dish for the faint-hearted. 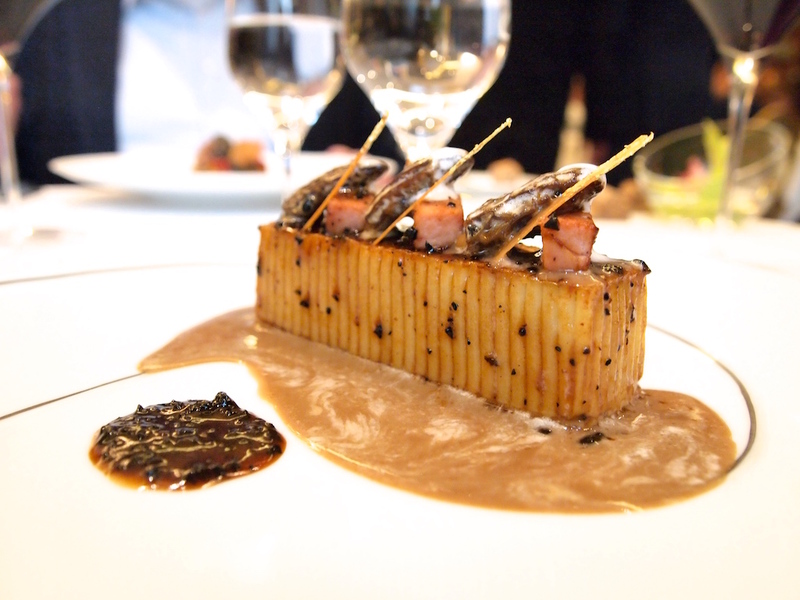 The meal continued with Le Squer's "Spaghetti en timbale truffée", an iconic dish that has been on the menu since his days at Ledoyen. A masterfully made bucatini timbale (the timbale referring to the mould), glazed with a rich truffle and veal reduction, and served with an exquisite truffle and cream sauce. 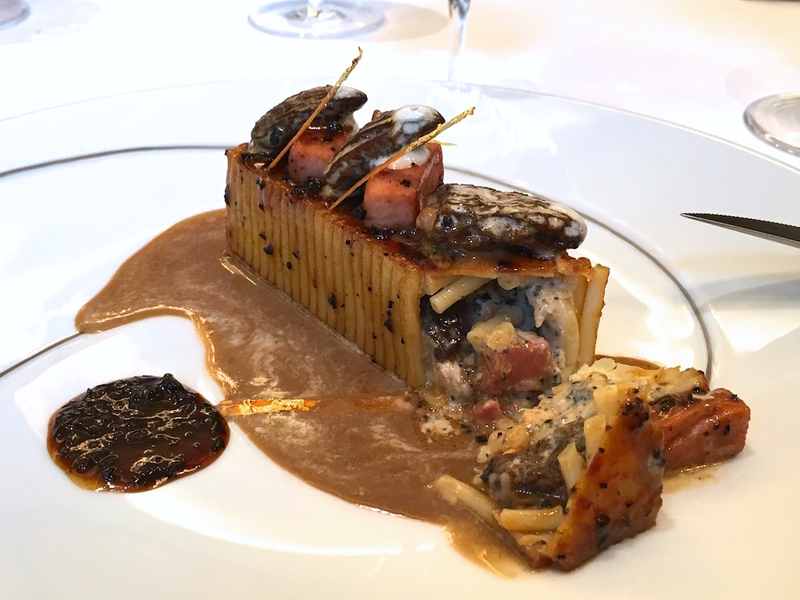 Inside the timbale was a luxurious creamy mixture of cooked ham, morel mushrooms, and black truffle. At first sight a dish with familiar flavours/ingredients, but delivered here in the best light possible and in such a harmonious manner, with the highest level of finesse. A display of stellar gastronomic superiority that leaves you with a warm glow. After the main course there was cheese, and then more superiority followed with a "Croquant de Pamplemousse", Le Squer's signature grapefruit dessert with a precise, layered presentation. The bottom layer was formed by candied grapefruit skin, followed by a layer of fresh (marinated) grapefruit, a crisp grapefruit and basil sugar tuile, a layer of cylinder shaped grapefruit parfait/sorbet and finally a crisp tuile of grapefruit caramel sprinkled with dill. After the initial crunch of the grapefruit caramel, you taste the smooth and refreshing grapefruit sorbet, followed by the juicy grapefruit flesh, releasing its wonderful sharp juices, and finally there's the bite and bittersweet taste of the candied rind. Grapefruit is used to phenomenal effect here, with textural indulgence and just the right amount of sugar for balance. Final course, and second (extra) dessert was a very precisely executed dish of three shiny chocolate "bars", two with a dark chocolate crème filling, and one with a salted caramel filling, accompanied by popping candy chocolate crumble and a quenelle of whipped cream. A ridiculously good chocolate dessert, with rich, luxurious textures, the chocolate crumble adding a nice playful touch. Finally there was a series of sweet treats, including a gorgeous Kouign Amann, a pastry speciality from Brittany. Restaurant Le Cinq as we know it today, came into being when Hotel Le George V reopened in 2000 after a three year, USD 125 million refurbishment. The owners made no secret of their ambitions for Le Cinq, when they employed Philippe Legendre as its new chef. Legendre had held three Michelin stars since 1990 at Taillevent and it only took him until 2003 to bring Le Cinq to his accustomed level. In 2007 Philippe Legendre left Le Cinq and was succeeded by Eric Briffard, a Meilleur Ouvrier de France (1994) with impeccable credentials. He had become head chef at Jamin in 1990 (then three stars under the aegis of Joël Robuchon) and was awarded two stars at the Plaza Athénée in 2000 and again at Les Elysées du Vernet in 2007. 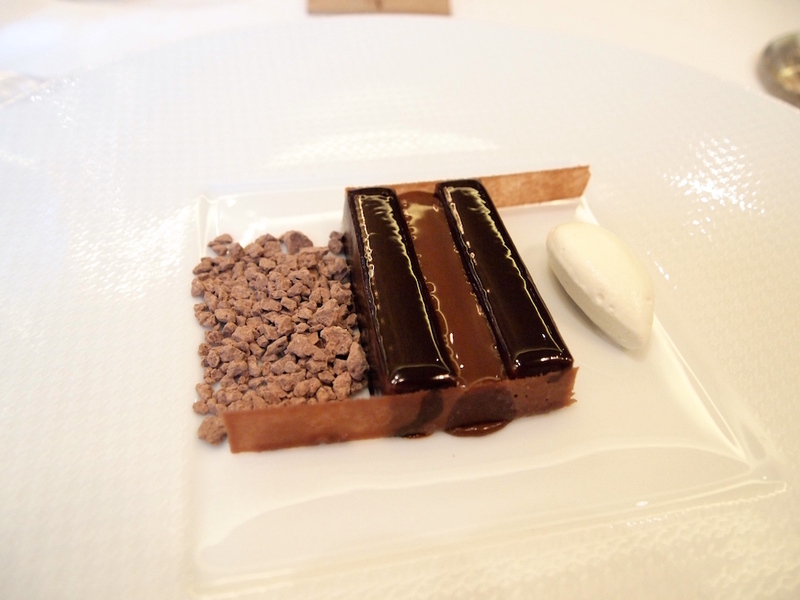 After Legendre left, Michelin demoted Le Cinq to two stars. Briffard held on to these until he left in 2014, but unfortunately the third star never materialised. Le Cinq is a well-established name on the Paris scene, but by getting Christian Le Squer on board, it has gained a new momentum and once again that third star is shining bright. 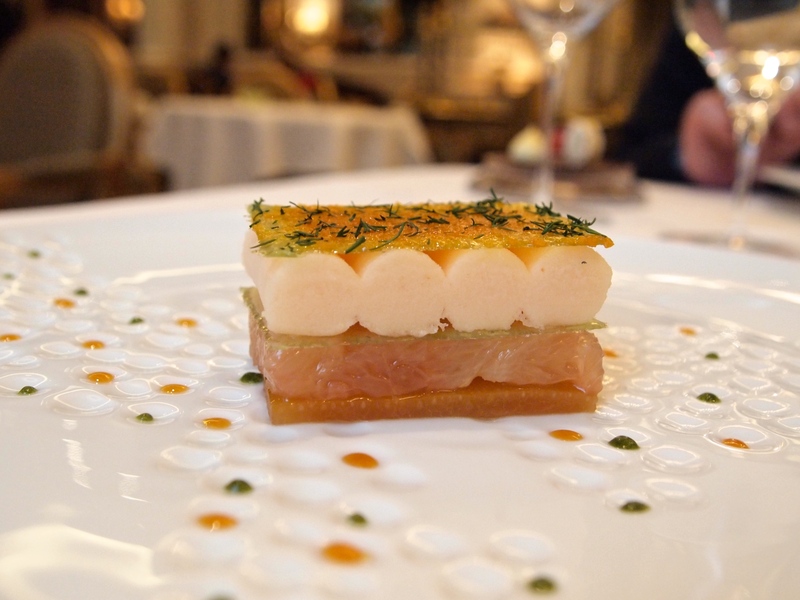 Le Squer's unequivocally grand and expressive cooking and Le Cinq's grandeur seem to be the perfect union. He only took up residence at Le Cinq some 18 months ago, but he clearly has already added his own spice to the restaurant. I'm glad that I incorporated two of his most lauded dishes from the Ledoyen years into my lunch menu. Two extraordinary dishes displaying the highest level of craftmanship and genuine skill. The spaghetti timbale - the Birkin of timbales - as well as the grapefruit dessert deserve an individual score of 100/100. The relatively new and brilliant "Gratinée d'Oignons à la Parisienne / contemporaine" is also proof that Christian Le Squer is not resting on his laurels and can deliver excellence on both the classical and contemporary sides of the haute cuinine spectrum. Spherification can be a hit-and-miss technique; here it was a sure hit. The beauty of Le Squer's cooking is that it is so unashamedly outspoken with maximum flavours and with high aesthetic appeal; a signature style that already has attracted many international gourmands and is an inspiration to aspiring chefs around the world. But above all, it is a restaurant like this that will hopefully "uncloset" many fine dining closetists. It's ok: you can come out now.